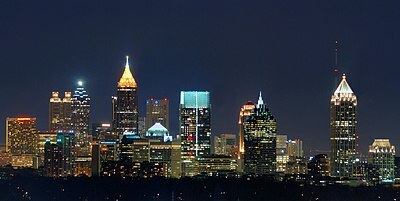 Atlanta, the capital and largest city of the U.S. state of Georgia, is home to at least 37 skyscrapers over 400 feet (122 m) tall. Most of these are clustered around Peachtree Street in the Downtown, Midtown, and Buckhead neighborhoods, with the suburban city of Sandy Springs also being the site of several skyscrapers. The tallest building in Atlanta is the 55-story Bank of America Plaza, which rises 1,023 feet (312 m) and was completed in 1992. The Bank of America Plaza was formerly the tallest building in the United States outside New York City and Chicago, and the 9th-tallest building in the U.S. overall. The second-tallest building in Atlanta is SunTrust Plaza, which rises 871 feet (265 m). The history of skyscrapers in Atlanta began with the completion in 1892 of the Equitable Building. The city later went through a major building boom, which began in the 1980s and continued until the mid 1990s; most of the city's skyscrapers, including its four tallest, have all been completed since 1985. Overall, Atlanta is the site of 15 completed buildings that are at least 492 feet (150 m) high. As of 2012[update], the skyline of Atlanta is ranked second in the Southeastern United States (behind Miami), seventh in the United States and 30th in the world with 56 buildings rising at least 330 feet (100 m) in height. Of the 20 tallest buildings in Georgia, 18 are located in Atlanta; the other two, Concourse Corporate Center V & VI are in the neighboring city of Sandy Springs and stand as the tallest suburban buildings in the country. The Equitable Building, completed in 1892, is generally regarded as the first high-rise in the city. Atlanta went through a major building boom from the mid-1980s to the early 1990s, during which the city saw the completion of 11 of its 30 tallest buildings, including the Bank of America Plaza, SunTrust Plaza, One Atlantic Center, and 191 Peachtree Tower. Atlanta entered another high-rise construction boom in the early 2000s. The city has since seen the completion of 13 buildings that rise over 400 feet (122 m) in height, including 3344 Peachtree, the tallest structure in Buckhead at 665 feet (203 m); it was topped out in October 2007 and completed in 2008. Several of the downtown buildings were damaged in a major tornado in March 2008, scattering glass from several hundred feet. It took workers several days to clean the buildings and remove all of the loose shards of glass from the skyscrapers. No structural damage was reported, and by late 2010 each skyscraper had all of its windows replaced. Window blinds and other office objects from the tall buildings were found as far away as Oakland Cemetery. This list ranks Atlanta skyscrapers that stand at least 400 feet (122 m) tall, based on standard height measurement. This includes spires and architectural details but does not include antenna masts. An equal sign (=) following a rank indicates the same height between two or more buildings. The "Year" column indicates the year in which a building was completed. 1 Bank of America Plaza 1,023 (311.8) 55 1992 33°46′15.2″N 84°23′10.3″W﻿ / ﻿33.770889°N 84.386194°W﻿ / 33.770889; -84.386194﻿ (Bank of America Plaza) 86th-tallest building in the world; 15th-tallest in the United States; tallest in Georgia; tallest in the Southern United States. Tallest building constructed in Atlanta in the 1990s. Tallest office building in Atlanta. Tallest building in any U.S. state capital. 2 SunTrust Plaza 867 (264.3) 60 1992 33°45′45.3″N 84°23′11.6″W﻿ / ﻿33.762583°N 84.386556°W﻿ / 33.762583; -84.386556﻿ (SunTrust Plaza) 251st-tallest building in the world; 37th-tallest in the United States; 2nd-tallest in Georgia. 3 One Atlantic Center 820 (249.9) 50 1987 33°47′13.3″N 84°23′14.4″W﻿ / ﻿33.787028°N 84.387333°W﻿ / 33.787028; -84.387333﻿ (One Atlantic Center) 355th-tallest building in the world; 49th-tallest in the United States; 3rd-tallest in Georgia. Tallest building constructed in Atlanta in the 1980s. 4 191 Peachtree Tower 770 (234.7) 50 1992 33°45′32.4″N 84°23′11.9″W﻿ / ﻿33.759000°N 84.386639°W﻿ / 33.759000; -84.386639﻿ (191 Peachtree Tower) 73rd-tallest in the United States; 4th-tallest in Georgia. 5 Westin Peachtree Plaza 723 (220.4) 73 1976 33°45′34″N 84°23′18.9″W﻿ / ﻿33.75944°N 84.388583°W﻿ / 33.75944; -84.388583﻿ (Westin Peachtree Plaza) 5th-tallest in Georgia. Tallest building constructed in Atlanta in the 1970s. Tallest hotel in Atlanta. 6 Georgia Pacific Tower 697 (212.5) 51 1981 33°45′26.5″N 84°23′13.9″W﻿ / ﻿33.757361°N 84.387194°W﻿ / 33.757361; -84.387194﻿ (Georgia Pacific Tower) 6th-tallest in Georgia. 7 Promenade II 691 (210.6) 40 1989 33°47′16.1″N 84°23′6.4″W﻿ / ﻿33.787806°N 84.385111°W﻿ / 33.787806; -84.385111﻿ (Promenade II) 7th-tallest in Georgia. 8 AT&T Building 677 (206.4) 47 1980 33°46′21.7″N 84°23′12.2″W﻿ / ﻿33.772694°N 84.386722°W﻿ / 33.772694; -84.386722﻿ (AT&T Building) 8th-tallest in Georgia. 9 Sovereign 665 (202.7) 48 2008 33°50′49.1″N 84°22′7.2″W﻿ / ﻿33.846972°N 84.368667°W﻿ / 33.846972; -84.368667﻿ (Sovereign) 9th-tallest in Georgia. Tallest building constructed in Atlanta in the 2000s. 10 1180 Peachtree 657 (200.2) 41 2006 33°47′12.7″N 84°23′1.8″W﻿ / ﻿33.786861°N 84.383833°W﻿ / 33.786861; -84.383833﻿ (1180 Peachtree) 10th-tallest in Georgia. 11 GLG Grand-Four Seasons 609 (185.6) 53 1992 33°47′10.6″N 84°23′7.6″W﻿ / ﻿33.786278°N 84.385444°W﻿ / 33.786278; -84.385444﻿ (GLG Grand-Four Seasons) 11th-tallest in Georgia. 12 The Mansion on Peachtree 580 (176.8) 42 2008 33°50′58.4″N 84°22′0.2″W﻿ / ﻿33.849556°N 84.366722°W﻿ / 33.849556; -84.366722﻿ (The Mansion on Peachtree) 12th-tallest in Georgia. 13 The Atlantic 577 (175.9) 46 2009 33°47′26.8″N 84°23′51.7″W﻿ / ﻿33.790778°N 84.397694°W﻿ / 33.790778; -84.397694﻿ (The Atlantic) 13th-tallest in Georgia. Tallest residential building in Atlanta. 14 Two Peachtree Building 556 (169) 44 1966 33°45′15″N 84°23′26″W﻿ / ﻿33.754158°N 84.390589°W﻿ / 33.754158; -84.390589 Also known as the State of Georgia Building. Tallest building constructed in Atlanta in the 1960s. This lists buildings that are under construction in Atlanta and are planned to rise at least 300 feet (91 m). Buildings whose construction is on-hold are also included. A floor count of 30 stories is used as the cutoff for buildings whose heights have not yet been released by their developers. The Flatiron Building stood as the tallest building in Atlanta from 1897 until 1901. This lists buildings that once held the title of tallest building in Atlanta. A. ^ This building was demolished in 1971. B. ^ a b c d e Official height figures have never been released by this building's developer. C. ^ This building was originally known as the Empire Building (from 1901 until 1920), and was the headquarters of Citizens & Southern National Bank (merged with NationsBank/merged with Bank of America) but has been known as the Georgia State University J. Mack Robinson College of Business Administration Building since 1992. D. ^ This building was originally known as the Rhodes-Haverty Building, but has since been renamed the Marriott Residence Inn-Downtown. E. ^ This building was originally known Fulton National Bank, but has since been renamed 55 Marietta Street. ^ "Bank of America Plaza". Emporis.com. Archived from the original on 2008-03-16. Retrieved 2012-08-22. ^ "Diagram of Completed United States Skyscrapers". SkyscraperPage.com. Retrieved 2012-08-22. ^ "SunTrust Plaza". Emporis.com. Archived from the original on 2008-03-16. Retrieved 2012-08-22. ^ a b c "Equitable Building". Emporis.com. Retrieved 2008-05-15. ^ "Cities with the most skyscrapers". Emprois.com. Archived from the original on 2012-10-03. Retrieved 2012-08-22. ^ "Georgia skyscrapers". SkyscraperPage.com. Retrieved 2008-05-28. ^ "Concourse Corporate Center V". SkyscraperPage.com. Archived from the original on 2012-10-10. Retrieved 2012-08-22. ^ "Concourse Corporate Center VI". SkyscraperPage.com. Archived from the original on 2012-10-10. Retrieved 2012-08-22. ^ "Sovereign". Emporis.com. Archived from the original on 2007-09-29. Retrieved 2008-05-15. ^ "Bank of America Plaza". The Skyscraper Center. CTBUH. Retrieved November 25, 2017. ^ "Bank of America Plaza". Emporis. Retrieved November 25, 2017. ^ "Bank of America Plaza". Skyscraper Source Media. Retrieved November 25, 2017. ^ "SunTrust Plaza". The Skyscraper Center. CTBUH. Retrieved November 26, 2017. ^ "SunTrust Plaza". Emporis. Retrieved November 26, 2017. ^ "SunTrust Plaza". Skyscraper Source Media. Retrieved November 26, 2017. ^ "One Atlantic Centera". The Skyscraper Center. CTBUH. Retrieved November 26, 2017. ^ "One Atlantic Center". Emporis. Retrieved November 26, 2017. ^ "One Atlantic Center". Skyscraper Source Media. Retrieved November 26, 2017. ^ "191 Peachtree Tower". The Skyscraper Center. CTBUH. Retrieved November 26, 2017. ^ "191 Peachtree Tower". Emporis. Retrieved November 26, 2017. ^ "191 Peachtree Tower". Skyscraper Source Media. Retrieved November 26, 2017. ^ "Westin Peachtree Plaza". The Skyscraper Center. CTBUH. Retrieved November 27, 2017. ^ "Westin Peachtree Plaza". Emporis. Retrieved November 27, 2017. ^ "Westin Peachtree Plaza". Skyscraper Source Media. Retrieved November 27, 2017. ^ "Georgia Pacific Tower". The Skyscraper Center. CTBUH. Retrieved November 27, 2017. ^ "Georgia Pacific Tower". Emporis. Retrieved November 27, 2017. ^ "Georgia Pacific Tower". Skyscraper Source Media. Retrieved November 27, 2017. ^ "Promenade II". The Skyscraper Center. CTBUH. Retrieved November 27, 2017. ^ "Promenade II". Emporis. Retrieved November 27, 2017. ^ "Promenade II". Skyscraper Source Media. Retrieved November 27, 2017. ^ "AT&T Building". The Skyscraper Center. CTBUH. Retrieved November 27, 2017. ^ "AT&T Building". Emporis. Retrieved November 27, 2017. ^ "AT&T Building". Skyscraper Source Media. Retrieved November 27, 2017. ^ "Sovereign". The Skyscraper Center. CTBUH. Retrieved November 27, 2017. ^ "3344 Peachtree". Emporis. Retrieved November 27, 2017. ^ "3344 Peachtree". Skyscraper Source Media. Retrieved November 27, 2017. ^ "1180 Peachtree". The Skyscraper Center. CTBUH. Retrieved November 28, 2017. ^ "1180 Peachtree". Emporis. Retrieved November 28, 2017. ^ "1180 Peachtree". Skyscraper Source Media. Retrieved November 28, 2017. ^ "GLG Grand-Four Seasons". The Skyscraper Center. CTBUH. Retrieved November 28, 2017. ^ "GLG Grand / Four Seasons Hotel". Emporis. Retrieved November 28, 2017. ^ "GLG Grand/Four Seasons Hotel". Skyscraper Source Media. Retrieved November 28, 2017. ^ "The Mansion on Peachtree". The Skyscraper Center. CTBUH. Retrieved November 29, 2017. ^ "Mandarin Oriental Atlanta". Emporis. Retrieved November 29, 2017. ^ "The Mansion on Peachtree". Skyscraper Source Media. Retrieved November 28, 2017. ^ "The Atlantic". The Skyscraper Center. CTBUH. Retrieved November 30, 2017. ^ "The Atlantic". Emporis. Retrieved November 30, 2017. ^ "The Atlantic". Skyscraper Source Media. Retrieved November 30, 2017. ^ "State of Georgia Building". Emporis.com. Archived from the original on 2007-02-11. Retrieved 2007-12-25. ^ a b "2 Peachtree Building". SkyscraperPage.com. Archived from the original on 2008-04-24. Retrieved 2008-05-15. ^ "Marriott Marquis Hotel". Emporis.com. Archived from the original on 2008-03-17. Retrieved 2007-12-25. ^ "Marriott Marquis Hotel". SkyscraperPage.com. Archived from the original on 2007-12-19. Retrieved 2007-12-25. ^ "TWELVE Centennial Park Tower I". Emporis.com. Archived from the original on 2007-09-29. Retrieved 2007-12-25. ^ "Twelve Centennial Park One". SkyscraperPage.com. Archived from the original on 2007-12-19. Retrieved 2007-12-25. ^ "Midtown One Office Tower". SkyscraperPage.com. Archived from the original on 2012-08-07. Retrieved 2012-08-22. ^ "Park Avenue Condominiums". Emporis.com. Archived from the original on 2007-05-26. Retrieved 2007-12-25. ^ "Park Avenue Condominiums". SkyscraperPage.com. Archived from the original on 2007-12-19. Retrieved 2007-12-25. ^ "Terminus 100". Emporis.com. Archived from the original on 2007-05-13. Retrieved 2007-12-25. ^ "Terminus 100". SkyscraperPage.com. Archived from the original on 2007-12-19. Retrieved 2007-12-25. ^ "ViewPoint". Emporis.com. Archived from the original on 2007-03-26. Retrieved 2008-05-16. ^ "ViewPoint". SkyscraperPage.com. Archived from the original on 2008-04-24. Retrieved 2008-05-16. ^ "Paramount at Buckhead". Emporis.com. Archived from the original on 2007-05-13. Retrieved 2008-05-16. ^ "The Paramount". SkyscraperPage.com. Archived from the original on 2008-04-24. Retrieved 2008-05-16. ^ "3630 Peachtree Road". Emporis.com. Retrieved 2007-12-25. ^ "The Ritz-Carlton Residences". SkyscraperPage.com. Archived from the original on 2012-08-07. Retrieved 2012-08-22. ^ "Loews Midtown". Emporis.com. Retrieved 2012-08-22. ^ "Loews Midtown". SkyscraperPage.com. Archived from the original on 2012-08-07. Retrieved 2012-08-22. ^ "Centennial Tower". Emporis.com. Archived from the original on 2007-05-13. Retrieved 2007-12-25. ^ "Centennial Tower". SkyscraperPage.com. Archived from the original on 2007-12-19. Retrieved 2007-12-25. ^ "Spire". SkyscraperPage.com. Archived from the original on 2007-12-19. Retrieved 2007-12-25. ^ "Equitable Building". Emporis.com. Archived from the original on 2008-03-01. Retrieved 2007-12-25. ^ "Equitable Building". SkyscraperPage.com. Archived from the original on 2007-12-19. Retrieved 2007-12-25. ^ "Buckhead Grand". Emporis.com. Archived from the original on 2007-05-12. Retrieved 2007-12-25. ^ "Buckhead Grand". SkyscraperPage.com. Archived from the original on 2007-12-19. Retrieved 2007-12-25. ^ "Two Alliance Center". Emporis.com. Archived from the original on 2008-02-29. Retrieved 2012-08-22. ^ "One Park Tower". Emporis.com. Archived from the original on 2007-02-22. Retrieved 2007-12-25. ^ a b "1 Park Tower". SkyscraperPage.com. Archived from the original on 2008-04-24. Retrieved 2008-05-15. ^ "1100 Peachtree". Emporis.com. Archived from the original on 2007-09-30. Retrieved 2007-12-25. ^ "1100 Peachtree Street". SkyscraperPage.com. Archived from the original on 2007-12-19. Retrieved 2007-12-25. ^ "Atlanta Plaza One". Emporis.com. Archived from the original on 2007-05-12. Retrieved 2007-12-25. ^ "Atlanta Plaza 1". SkyscraperPage.com. Archived from the original on 2007-12-19. Retrieved 2007-12-25. ^ "Park Place on Peachtree". Emporis.com. Archived from the original on 2007-05-12. Retrieved 2007-12-25. ^ "Park Place". SkyscraperPage.com. Archived from the original on 2007-12-19. Retrieved 2007-12-25. ^ "2828 Peachtree Condominiums". Emporis.com. Retrieved 2007-12-25. ^ "2828 Peachtree". SkyscraperPage.com. Archived from the original on 2007-12-19. Retrieved 2007-12-25. ^ "Atlantic House". SkyscraperPage.com. Archived from the original on 2015-07-22. Retrieved 2014-05-28. ^ "1280 West". Emporis.com. Archived from the original on 2007-05-13. Retrieved 2007-12-25. ^ "1280 West". SkyscraperPage.com. Archived from the original on 2007-12-19. Retrieved 2007-12-25. ^ "Peachtree Summit #1". Emporis.com. Archived from the original on 2007-05-12. Retrieved 2007-12-25. ^ "Peachtree Summit 1". SkyscraperPage.com. Archived from the original on 2007-12-19. Retrieved 2007-12-25. ^ "One Coca-Cola Plaza". Emporis.com. Archived from the original on 2007-09-30. Retrieved 2007-12-25. ^ "One Coca-Cola Plaza". SkyscraperPage.com. Archived from the original on 2007-12-19. Retrieved 2007-12-25. ^ "Tower Place 100". Emporis.com. Archived from the original on 2007-05-25. Retrieved 2007-12-25. ^ "Tower Place 100". SkyscraperPage.com. Archived from the original on 2007-12-19. Retrieved 2007-12-25. ^ "Three Alliance Center". SkyscraperPage. Skyscraper Source Media. Archived from the original on 5 March 2016. Retrieved 25 February 2017. ^ Green, Josh (15 March 2016). "Midtown Atlanta's Tallest Tower in Ages has Launched". Curbed Atlanta. Vox Media. Archived from the original on 17 October 2016. Retrieved 25 February 2017. ^ Kahn, Michael (11 November 2016). "EVIVA Peachtree in Midtown: Here's the scoop on what to expect". Curbed Atlanta. Vox Media. Archived from the original on 12 November 2016. Retrieved 25 February 2017. ^ "Flatiron Building". SkyscraperPage.com. Archived from the original on 2011-05-25. Retrieved 2008-05-15. ^ "J. Mack Robinson College of Business Administration". SkyscraperPage.com. Archived from the original on 2011-05-25. Retrieved 2008-05-15. Note that this reference states that the building was the tallest in the city through 1906; however sources for the Fourth National Bank building clearly show that the Bank building was at 16 stories, the tallest in the South in 1905. ^ "Advertisement for Fourth National Bank in Atlanta Constitution, January 8, 1905". Archived from the original on June 5, 2015. ^ "Candler Building". SkyscraperPage.com. Archived from the original on 2011-05-25. Retrieved 2008-05-15. ^ "Rhodes-Haverty Building". SkyscraperPage.com. Archived from the original on 2011-05-25. Retrieved 2008-05-15. ^ "55 Marietta Street". SkyscraperPage.com. Archived from the original on 2011-05-25. Retrieved 2008-05-15. ^ "Westin Peachtree Plaza". SkyscraperPage.com. Archived from the original on 2008-04-24. Retrieved 2008-05-15. ^ "One Atlantic Center". SkyscraperPage.com. Archived from the original on 2007-12-03. Retrieved 2007-12-25. ^ "Bank of America Plaza". SkyscraperPage.com. Archived from the original on 2008-01-15. Retrieved 2007-12-25. ^ "Flatiron Building". Emporis. Archived from the original on 2008-03-18. Retrieved 2008-05-15. ^ "J. Mack Robinson College of Business Administration". Emporis. Retrieved 2008-05-31. Michael Kahn (March 24, 2016). "Midtown Atlanta's Latest Projects, Mapped". Curbed Atlanta. "High-rise Buildings of Atlanta". Emporis.com. Retrieved 2012-08-22. This page was last edited on 2 April 2019, at 21:42 (UTC).